Do I need a calcium supplement if I'm pregnant? Calcium is an essential mineral for pregnant women. As your baby develops, your body will supply between 50 and 330 mg of calcium every day to the fetus to help develop strong bones and teeth. That calcium will come from your own internal stores and your diet. To provide this much calcium to your baby, the average pregnant woman should be getting 1,300 mg per day. That’s the equivalent of about four servings of dairy or calcium-fortified foods every day. Consuming anything below 600 mg per day can contribute to a “negative calcium balance,” meaning that you’re actually losing calcium in your bones. This can increase your risk of osteoporosis later in life. To ensure they’re getting enough calcium and nutrients, many women take a prenatal vitamin. Although they vary somewhat, the typical prenatal vitamin has about 200–300 mg of calcium. 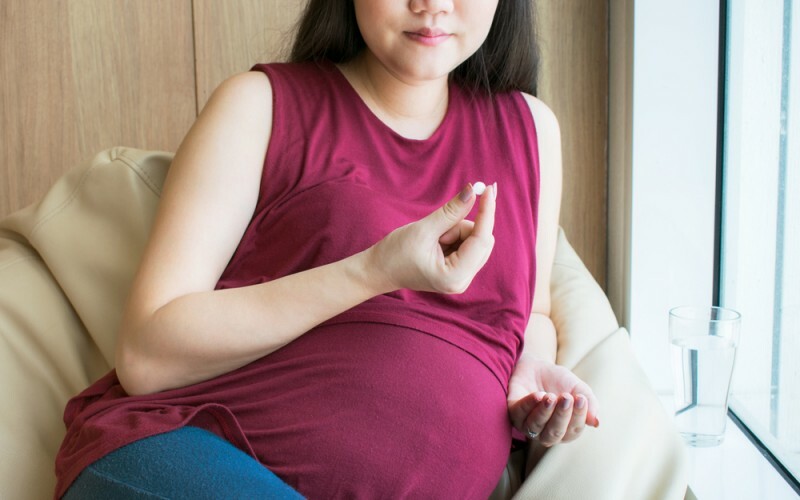 Does this mean you should take an extra calcium supplement on top of your prenatal vitamin? According to the National Institutes of Health, the preferred source of calcium is from food, such as calcium-rich dairy products like yogurt or fortified cereals. However, according to the National Health and Nutrition Examination Survey, the average American woman gets between 748 and 968 mg per day, which is less than recommended for a pregnant woman. When calcium supplements are added in, it brings the average daily intake up to a better 918 to 1296 mg per day. If you’re pregnant and taking a high-quality prenatal supplement, you can get all the extra calcium you need by eating about 3 servings of calcium-rich food every day. However, if your diet lacks good sources of calcium (for example, if you avoid dairy), then you should consider asking your doctor about adding a calcium supplement to your daily routine. Pregnant women are advised to get adequate calcium per day. The average American woman gets up to 950 mg per day from her diet. Prenatal vitamins add between 200-300 mg per day of calcium. Experts recommend that you get your calcium from food, with about 3 servings a day. If you’re concerned you’re not getting enough, ask your doctor about a calcium supplement. Beinder E. [Calcium-supplementation in pregnancy–is it a must?]. Ther Umsch. 2007 May;64(5):243-7. Institute of Medicine (US) Committee on Nutritional Status During Pregnancy and Lactation. Washington (DC): National Academies Press (US); 1990. National Institutes of Health. Calcium.